Heat butter in a heavy saute pan over medium heat. Saute the onions and bell peppers until they are semi-soft, 5-7 minutes. Add Thai red curry paste to the onions and peppers and stir well over the heat to mix. 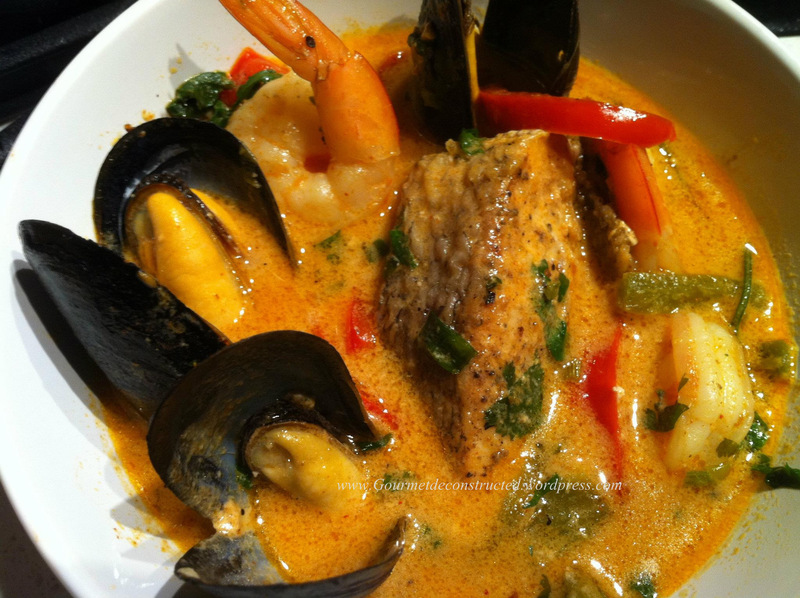 Pour in the coconut milk, lime juice, fish sauce, brown sugar, and kaffir lime leaves (if using). Simmer over low heat, uncovered, for around 10 minutes so the flavors can blend and the broth can reduce slightly. In the meantime, rinse the fish and shrimp with cold water, pat dry, and lightly season with salt. Place the fish and shrimp in the saute pan, and nestle them into the broth as much as possible. Simmer on very low, covered, for 5 minutes, mix in steamed mussels and simmer cover another 5-7 minutes until the fish flakes easily. During the last minute or two of cooking, add chopped cilantro. Serve hot over Jasmine rice in a bowl along with broth. Enjoy!